The ADS7824 CAN acquire and convert 12 bits to within 0.5 LSB in 25s max while consuming only 50mW max. Laser-trimmed scaling resistors provide the standard industrial 10V input range and channel-to-channel matching of 0.1%. 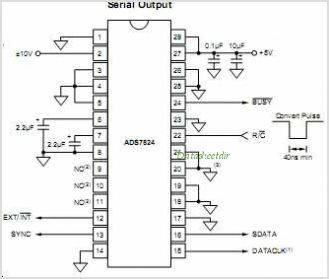 The ADS7824 is a low-power 12-bit sampling A/D with a four channel input multiplexer, S/H, Clock reference, and a parallel/serial Microprocessor Interface It CAN be configured in a continuous conversion mode to sequentially digitize all four channels. The 28-pin ADS7824 is available in a plastic 0.3" DIP and in a SOIC, both fully specified for operation over the industrial ?40C to +85C range. 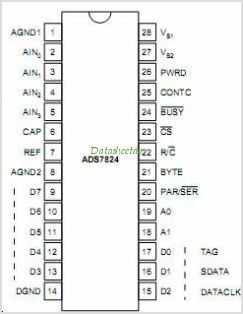 This is one package pinout of ADS7824,If you need more pinouts please download ADS7824's pdf datasheet. This is one application circuit of ADS7824,If you need more circuits,please download ADS7824's pdf datasheet.